Elsie-May, of the town of Tiverton, was well known for her cake-making and catering skills, leaving behind a slew of early 20th century family recipes. 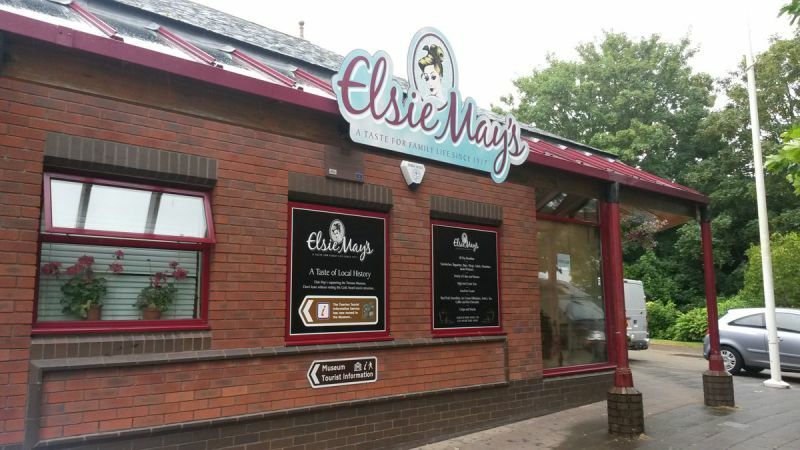 Her legacy lives on with the establishment of Elsie-May’s café/coffee shop by her granddaughter, Mandy Jenks. The Jenks family café was inspired by the retro American-style diner, that theme is carried out throughout the branding on both the interior and exterior. 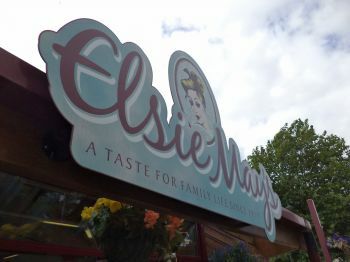 Wanting to use the late Elsie-May’s portrait in the logo, the family-run café/coffee shop signage was designed, fabricated and printed by Ken White Signs in Devon, UK. Unlike the traditional sign company, Ken White Signs does graphic and product design, as well as logos and branding. Their expertise in this capacity is seen in the retro-style branding of the café, in collaboration with artist Ant Barron. The signage graphics were printed on self-adhesive vinyl, matte laminated and then applied to face of the Dibond aluminum composite.